Can't bear to stop looking at your mobile telephone? Not even for long enough to stuff a pizza into your mouth while occasionally looking up to acknowledge the presence of the person you're eating it with? You're not alone. You're part of a larger problem with modern society, but we'll not address that here. And besides, it's a problem about to be fixed by the experts at Pizza Express. 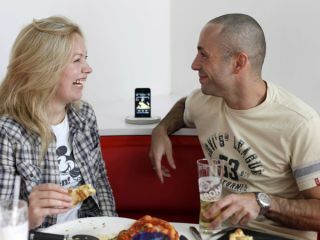 The supplier of round foodstuffs is launching a whole new category of dining experience, which will include built-in iPod docks beside its redesigned tables. So you can eat your Hot Meat Feast - or pasta for the lady - without having to worry about the modern problem of your battery going flat and therefore having to make conversation with the person you're with. The new dough consumption pods also include a rounded hood arrangement, which the company says helps black out background noise. Not that background noise is much of a problem these days, as all we do is sit still and look at telephones in silence all day. Or is that just us? A category of laptop you may not be aware of has been updated, with the latest military-spec models from VT Miltope revealed this week. The tech specs of the company's combat-ready RLC-3 war-proof laptop are rather odd - the maker claims it can survive being dropped 26 times from a height of three feet. It can also carry on working after being rained on in a 20mph wind and has been certified fungus proof, according to the PDF data sheet. So if you have a three-foot-high coffee table and live in a damp, mouldy basement flat, it'll be a good replacement for that knackered old Acer of yours. Need a good piece of Star Wars merchandise? Planning on selling your house soon anyway? Then you might want to make an excuse to be in the vicinity of Christie's auction house on 25 November, as that's when the ultimate, ultimate, most ultimate piece of Star Wars memorabilia goes up for sale - an original Darth Vader costume. Expected to sell for between £160k and £230k, this particular model of Vader case is thought to have been made for filming The Empire Strikes Back. Hopefully George Lucas hasn't been needlessly fiddling with it, retro-fitting loads of pointless new gadgets, cutting new eye-holes and the like over the last 27 years. Finally, a gadget to reveal precisely what is causing all those strange groans coming through the walls from the flat next-door between 11.20pm and 11.25pm every Friday night - the US military's new through-the-walls imaging system. Actually, we've already grossly exaggerated the actual tech capabilities of the AN/PPS-26 STTW out of all proportion. The thing has the ability to scan for weak signs of motion through (non-metal) walls, using radar. That's it. There will be no pictures of Mrs Williams getting undressed. The other downside, when applied to military situations, is that it "could be a cow or a chimpanzee or a human being" generating the movements, as it's sadly not particularly specific about what's moving about. Best shoot it, anyway.